All is worthwhile if the soul is not small. Not sure what might be the expression in English to express my level of frustration, but I finally gave up on Lua and the Nodemcu firmware for the ESP8266. The combo of ESPlorer and Nodemcu with the fact that isn’t required to flash the ESP8266 to deploy and test new code is in fact a great advantage. But this comes with a price, a hefty price. Above certain levels of complexity or code size, the Nodemcu firmware just starts to reboot randomly or hangs, and this adds a high level of frustration to developing medium size program. Add one more instruction, or line, and presto. It doesn’t work anymore, and I’m starting to delete comments, spaces, empty lines, to make it work again… Why bother… I’m not alone on this one: 4 reasons for leaving nodemcu…. My opinion Nodemcu is great for simple things and fine for testing, even if there is the need to learn Lua. Anything above that, there are better alternatives now and on the horizon. The problem that Nodemcu solves is the fact that we don’t need to flash any new firmware to test new programs or code. 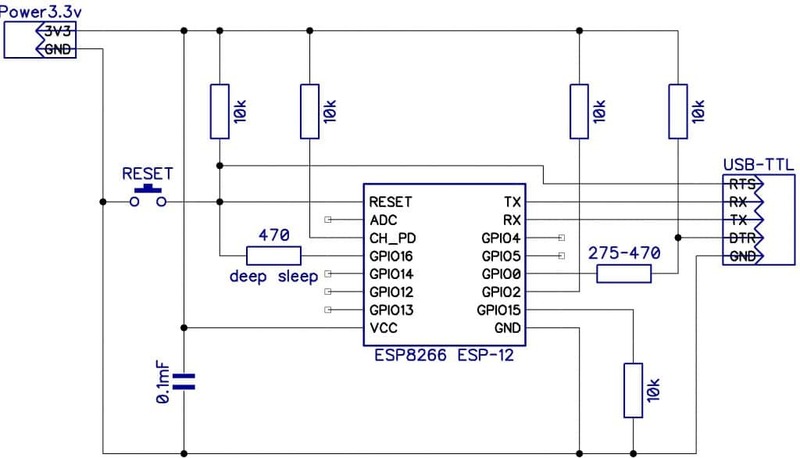 To flash new firmware we need to pull GPIO0 to Ground and pulse reset and then use a program, like esptool.py to push the new firmware to the chip. With Nodemcu we do this only once, on the initial ESP8266 configuration. For other alternative firmwares, we need to always flash the firmware with the new code/program. But the esptool.py holds a secret, it can pulse the physical serial port lines DTR and RTS to command GPIO0 and RESET to initiate the ESP8266 in flash mode, transfer the firmware, and when it ends releases the lines and allows the ESP8266 to run the new code. All without changing any connections on the ESP8266 at the physical level. In fact with this we can have the same functionality as the Nodemcu witth other firmwares. Off course off the shelf (ebay…) chips don’t do that, but I’m aware that Nodemcu and Olimex boards do support this kind of flashing mode control through the serial port. I could just bought one of these, but after programming the ESP8266 remains attached to that support electronics (serial chip) that might not be needed anymore. So off we go building a developer board that allows the easy flashing and programming the ESP8266 but then allows the chip, namely ESP-01 and ESP-12 to detach and be used on their final board. My idealized board and in semi state of final construction (proto board) supports the esptool.py firmware flashing, powers up either from a power supply or trough mini-usb, and can program the ESP-01 or ESP-12. 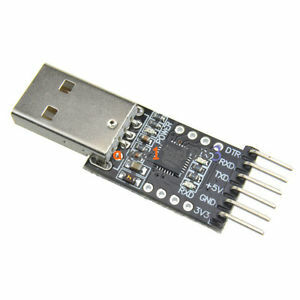 The USB serial adapter must be one that exposes the RTS and DTR lines, and provides the serial lines at 3.3V, the level for the ESP8266. There are CP2102 based boards available on ebay or DX, that expose all the lines and are 3.3v level. We need to solder a wire from the RTS pin to the ESP8266 RESET pin. I’m not powering up the board through the USB/serial adapter. 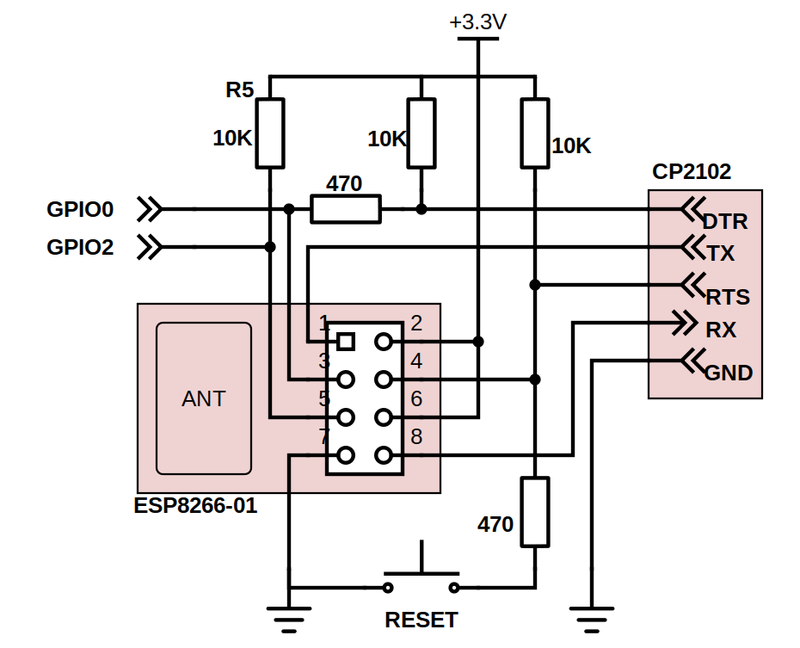 The serial port adapter does have a 3.3v power pin and also a 5v power pin. 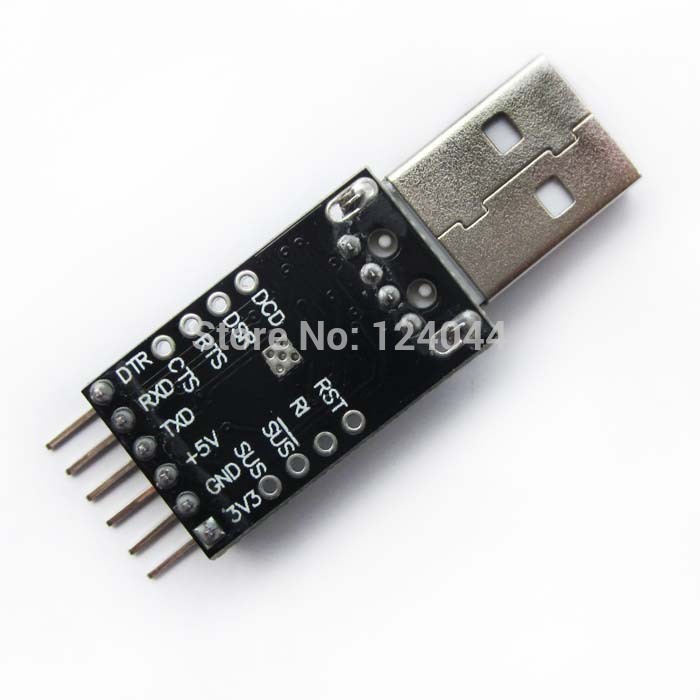 But the ESP8266 can demand high currents and the 3.3v regulator on the USB/serial adapter is almost certain not to be able to provide that current, even knowing that the USB port can provide 0.5A. 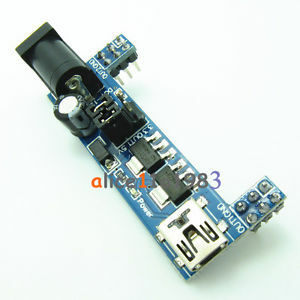 This specific board receives power through the usual DC jack, but with the mini-usb connector it also can receive power from an USB power supply (mobile charger), or, even better, an USB power bank. 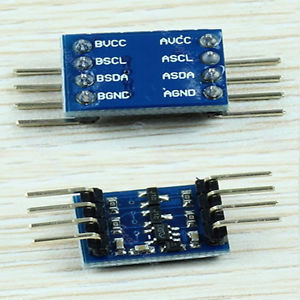 One of the MB102 board outputs is set to 3.3v to power up the ESP8266 boards and any other 3.3v devices, and the other other power output is set to 5V and connected to an IIC I2C level converter allowing the use of I2C 5V level devices like the 16×02 LCD screens. I’ve got this from the ESP8266.RU site, the same from ESPlorer, and done some modifications. With this schema, I can use the Arduino IDE and esptool.py to program the ESP8266 without the need of explicitly enter the firmware flash mode. Also I’m not showing in my schematics the ESP-12 connections, but they are in parallel for the RX, TX, RTS and DTR lines. Since now the RTS and DTR lines do have a function, some serial programs to access the ESP8266 serial console do not work. ESPlorer terminal works fine, and it has a handy DTR and RTS toggle buttons. I’m using my own brewed python pyserial based serial program, that correctly set the RTS and DTR lines, so that after flashing the firmware we can see the serial output if any. Also the way that reset switch resistor is in series with the switch AFTER the reset pin, means that with the serial port adapter is connected, the reset switch doesn’t work. Without being connected to the USB port, the reset switch works fine. The resistor is there to protect the CP2102 RTS line. I’m still waiting for the female headers to connect and start programming the ESP-12 on this developing board.